There are only 5 things I have to say about this. #3---i have many, many, many memories dealing with dumpsters from my childhood. p.s. sorry the pic is blurry--all i had was my cell phone and i had to take a photo! OK I just have to say how PERFECT this is! Mom and her dumpsters! For those of you who don't know, my mom is seriously ocd about trash! When she came to visit us in Wisconsin, we drove to 3 different store dumpsters to toss out my trash bags. She didn't want my trash can to fill up to quickly and so we disposed of it elsewhere! And truth be known... I MISS the dumpster diving days for CHIPS! That was AWESOME! Mom, you and your trash...or obsession of disposing it.... soooo funny! She truly is the "Dumpster Diva." You guys are not funny. Millie, didn't I see you getting a typewriter out of a dumpster once? And you seriously considered that rug at the chiropratic....good thing one of our customers got it. I also miss the days of day old chips...Yum! I never actually had to get in the dumpster, I just reaped the benefits!! Thanks Lucy! We all have a mom/dumpster memory. One day, here in Ohio, she had me so nervous about the whole thing that it gave me diarrhea. The sign said carboard ONLY and I wasn't sure the garbage with eaten fried chicken passed for cardboard. I just knew that something in that bag had my name on it. BUT I have to say that the chip thing was awesome! In all the time I've know her, Cassie never mentioned the dumpster diving thing. And yet, it didn't surprise me. Lucy Simmons, you're the best! Bec. There are some details that you have to wait to expose in a friendship. Dumpster diving is one of them. Acually, it all seems so normal to me that I never thought to tell you about my moms sonar for dumpsters. Sorry. You're right, Lucy Simmons ROCKS!!!! 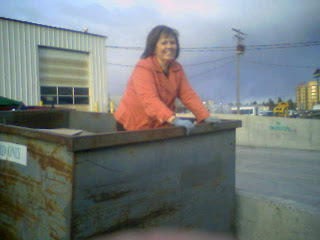 Yes, our mother is always on top of the dumpster situation....but my mom forgot to mention who she gave the boosts to get inside of the dumpsters to hand her the tasty "treasures". ME!!! One time a car was driving by, so my mom closed the lid on me. It was actually pretty fun. I miss the good old days. I absolutely remember those dumpster diving days! My mom forgot to mention that she gave me the boosts to jump inside to hand her the goodies. One time while I was inside "searching", a car passed by--so she closed the lid while I was inside! I miss the good old days!